Two MiRoR research fellows, Camila Olarte Parra (University of Ghent) and Lorenzo Bertizzolo (University Paris Descartes) had the opportunity to interview Nichole Taske, Associate Director in Methods and Economics at the National Institute for Health and Care Excellence (NICE), who shared with us details of her career and background, thoughts on NICE missions and challenges and tips for young researchers. You started as a chemist, then you moved to genetics, while afterwards you did two masters in policy. How did all happen and why you made these choices? My initial degree was in just pure science bio-chemistry/chemistry. I developed an interest in genetics and my PhD was looking at inheritance of a particular muscle disease called malignant hyperthermia, also called malignant hyperpyrexia. My boss, or my PhD supervisor at the time, was one of the first to describe the disease in a very large family in Australia back in the 1960s. I was really fortunate to be offered a scholarship to work in his laboratory. This was around the time where advances in genetic testing was really taking off; we were at the very early stages of high-throughput genome sequencing. The potential for bringing genetic diagnoses into mainstream healthcare practice was starting to be realized, so it was quite an exciting time. So I developed an interest in understanding more about how that transition would be made – how we move from the laboratory-based science to healthcare provision. I wanted to get more involved in the policy side of things and made that move eventually, which coincided with a move from Australia to the UK to pursue post-doctoral studies. I think I was still a little naive when I left laboratory science, thinking “well now that they’ve sequenced the whole genome, this is really only going to be a matter of some years before we’ll all be sequenced as part of our GP appointment”. But we’re still not quite there yet so I guess I’m wiser for that. I am slightly frustrated, but still enthusiastic that we might realize the full potential of rapid genetic diagnoses at some point. Moving towards your actual work, could you share the milestones of your career, which steps you consider got you where you are now? I guess we’re so used to work in incremental changes and advance that I find it very hard to think in terms of milestones. When I finished my PhD: that was a milestone for me, personally. Professionally, I now work at NICE and part of our aim is to produce clinical guidelines and I see every guideline that we publish as a milestone in itself. I very much see the delivery of each of those products as something that has the potential to significantly improve health care practice. And I take that very personally, that responsibility. Each guideline can take up to 2 years to develop, each with their own challenges and issues and at times pushing methodological boundaries. So I see the successful delivery of each guideline as a milestone in itself. My title is Associate Director in Methods and Economics. As part of that role, I look after a team of methodologists and health economists. We have two main functions: one function is to oversee the quality assurance of all of the guidelines that go through the Centre for Guidelines. In that capacity, we’re fulfilling almost a peer review function. We check that the NICE methods and processes have been adhered to throughout the guideline development process. We ensure that the quality of the evidence reviews and the Health Economic Modelling that are informing the guideline is up to expected standards and that the committee has appropriately considered the balance of risks and benefits as part of their deliberations. And the other function is really to oversee, to keep abreast of important methodological developments in guideline development. It’s to ensure that we can embed best practice in our existing processes and methods and it’s constantly evaluating and identifying opportunities for doing what we do better, doing what we do more efficiently. Efficiency is very much a pressure now with fiscal constraints within which we’re all working in. So it’s about trying to keep abreast of all of that as well. How do you think your background influences your everyday work? One of the great strengths of working for an organization like NICE is that we all come with very different perspectives, very different training, very different backgrounds. I come from a scientific background and we’re very much trained as scientists to approach things very methodically, very systematically, very rigorously. You know, attention to detail is a core skill and it’s not something that you can necessarily learn. I think there’s a certain part of your nature that prescribes how you approach looking at things. So I bring that to my current role as I’m sure pretty much most of my team. But then thinking about the mix of skills in the team, we have health economists, we have methodologists; we often don’t come with any particular topic expertise but a lot of us do bring expertise in applying particular methodologies, for example qualitative or quantitative approaches to evidence syntheses, statistical expertise. One of the most exciting aspects in my job is working with these very skilled, very talented individuals from a diverse range of perspectives. What do you think gives you the professional satisfaction everyday or in the long run? Personally, it’s about producing the best quality guidelines that we can for the NHS. I often pause and reflect when we’re discussing the wording of specific recommendations; this could profoundly impact an enormous number of people who are receiving healthcare on the NHS. It’s one of the largest employers in the world, with one of the largest populations receiving universal healthcare. So it’s the potential impact of what we do, that is a huge responsibility for us as individuals. But certainly as a team, as a centre, as an organization, that can be hugely rewarding. You already gave us a list of the different tasks that you have as an Associate Director. If you have to give percentages, how much do you consider your role to be maybe scientific, academic, managerial or political, or maybe something else? 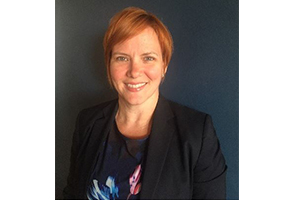 The academic/methodological scientific rigor aspect is probably the main part of my role: I’m bringing that perspective to all of the discussions I’m involved in at NICE, whether it’s about a specific guideline or whether it’s about the broader strategic direction of the Centre or the Organization. I seek to ensure that consideration of quality, rigor and scientific merit- qualities on which NICE’s reputation is built- is always on the agenda. Politics, both internal and external frequently plays into many aspects of my role. And then there is my team itself: there is a proportion of my time that is spent on managing and supporting the team. Teams do need a lot of support, ensuring that we’re keeping on track to meet our core objectives, appropriately involved in discussions and decisions about the direction of the centre or organization because if we don’t have a well informed, well motivated team, then everything else starts to suffer. So really, all the different aspects form part of the role. What were the main motivations that led you to work for NICE? 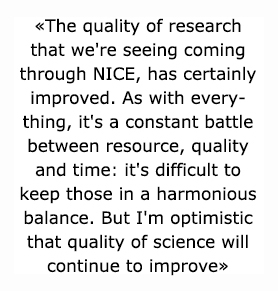 NICE is one of the world’s, if not the world’s largest producer of evidence-based guidance. It’s really interesting taking an international perspective: I come from Australia so I know from experience how decisions around health care provision are made very differently in Australia compared with the UK. I think NICE presents a really good model, making decisions on a national level using robust and transparent methods and processes and I certainly see the strengths and advantages of that approach. We’re very fortunate to have the resources to produce such high quality guidance and that the government has committed to that vision. We are well aware of being the envy of many countries that aspire to produce guidance to the standards we do. So it was very much a goal of mine to work in this kind of environment and I feel very fortunate. If you were to describe the NICE initiative and pitch NICE for us and our followers, how can you summarize it? NICE is well recognized as the authority providing very clear evidence-based guidance across a very wide remit in health and social care. Initially, NICE’s remit focused mainly on clinical health care delivery and management of care across primary and secondary care. More recently NICE has started producing guidance in areas of public health and social care. 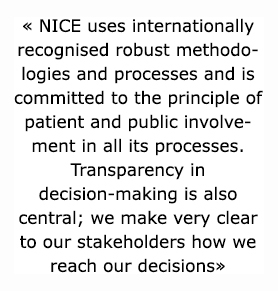 NICE uses internationally recognised robust methodologies and processes and is committed to the principle of patient and public involvement in all its processes. Transparency in decision-making is also central; we make very clear to our stakeholders how we reach our decisions. Finally, NICE’s decisions are just based on consideration of effectiveness but also cost-effectiveness. So our work is also about making some very tough decisions about what the service can and can’t afford. If you were asked to defend NICE from critics in scientific TV talk, what critics do think you would be facing and how would you answer? We are often at the receiving end of criticism, particularly when our decisions might be to not fund or provide particular interventions or medicines on the NHS. Ultimately, however, it comes down to opportunity cost: if we spend so much on X, then we won’t be able to afford or to provide healthcare to expected standards in other areas. NICE’s role is to make those difficult decisions as to what the service can and can’t afford. What’s important is to bring this understanding and context to the population we serve. I think the key strengths of NICE’s processes are the transparency of our decision-making and genuine consultation processes: it allows all our stakeholders to see and comment on our decisions. What are the main difficulties that an institution like NICE faces every day? On a very simplistic level, it’s about how we as an organisation support our committees in weighing up that balance between the benefits and harms of an intervention or of a drug, and trying to bring into that assessment the overall question of value and cost. That’s the crux of the difficulty that our committees are faced with in making those decisions. Do you think the biggest difficulty remains in reaching a decision or in making a decision acceptable for population, in communicating it? I’ve mentioned the challenges involved with making decisions, but certainly, there is also that aspect around how our decisions are communicated. We have a whole team at NICE whose job is to communicate our decisions and ensure that the public is kept informed of NICE decisions and the context in which they were made. Through NICE’s implementation team, we’re constantly trying to ensure that we actively engage with people outside of NICE, be that the medical professionals, or health and social care professionals more broadly. But it’s also about properly engaging through the guideline development process with the public, our stakeholders, our patients, our carers, our families, who are also receiving healthcare. After the accomplishments of NICE in the last years, what do you think will be its mission in in the immediate future? I see a particular focus for NICE at the moment is in ensuring a development of high quality guidance in social care. This is a relatively new area for NICE, and we have some particular challenges in working in that environment, in particular regarding the methodological quality of research in this area, which is generally not nearly as developed as in more clinical areas. Another significant challenge is how we assess cost effectiveness of interventions in that context. Certainly, with an aging population, a global phenomenon we’re all facing, the role of interventions in social care will become much more important and prominent across health and social care and how our service is able to respond to that pressure will be key. So I see there’s certainly a very important role for NICE in that context. Another challenge, also technical, will be how we will look at ‘real word evidence’, moving away from traditional randomized controlled trials, and how and when these other types of evidence should or shouldn’t inform our discussions and conclusions. You already walked us through your professional career and your current job and institution. So we turn to looking the future: what goals do you see for your immediate future? We recently had, well 18 months ago now, a big management change at NICE so my team is still quite a new team. A short term goal over the next probably two to three years at least, it’s about cementing that new team in our new structure and ensuring that we continue to grow and learn and develop as a team. In the longer term, I very much hope to still be at NICE. I see the environment, the challenges, they’re still very real and constantly evolving, which I find very interesting and personally fulfilling. So I very much hope to continue to be a part of that journey, that story. Is there a political or social issue that worries you which also potentially relates to your work? Personally, I think the biggest political and social issue in the UK right now is Brexit and I fear that it’s going to be hugely disruptive, impactful across the UK, across Europe. I’m slightly anxious about that both personally and professionally. To be completely honest, immediately after that, it was the first time in the 20 years I’ve been in the UK that I seriously thought: “is it time for us to go back to Australia?” I’m interested to see how that will play out. But I remain hopeful that we can build something that will be if not as good as being part of the EU, something that will be a close approximation of. Nowadays, productivity and efficiency are required for every researcher more than ever. Do you consider that it’s possible to teach a new generation of researchers to produce more honest, relevant, and quality science, if everyone around us talks about being productive and efficient? I hope so. Science has certainly changed so much since when I was doing laboratory-based science. I think there are just so many more checks and balances nowadays. The transparency and reporting has vastly improved over the last 20 years. The quality of research that we’re seeing coming through NICE, has certainly improved. As with everything, it’s a constant battle between resource, quality and time: it’s difficult to keep those in a harmonious balance. But I’m optimistic that quality of science will continue to improve. As you imagine we are struggling in our PhD life and our career as early stage researchers and so we would like to know what the biggest challenges in your career were. If you look back, are there some turns, for you career or for your work that you would have or not have taken, or some advice that you have for us through your experience? I think probably the biggest challenge for me was certainly making that move from laboratory-based science to desk-based research in a policy environment, moving from a purely academic environment to a public sector post. One of the most inspiring mentors I have had in my career was a woman called Anna Donald who was also Australian, and who also lived in the UK for many years. Anna supervised my MSc dissertation when I was at UCL. Anna was one of the first to use the term ‘evidology’ to describe the application of evidence-based medicine as a speciality in its own right. She really inspired me and encouraged me to make that jump. And I think if I can offer any advice it would be to seek out the views and the support of people who you admire, who work in the area that you want to work in. Also, always follow… not follow your dreams, that sounds too romantic especially for a scientist, but follow your interest. I think if you find yourself in an area that you genuinely find interesting, it doesn’t feel like work, it just feels like something that you should be doing. So I was really fortunate: I have been supported by some very special people and that makes such an enormous difference.